Applications are invited for the post of Project fellow in the research project entitled ‘Metamorphic history of Kerala segment of Madurai granulite block’ funded by Kerala State Council for Science Technology and Environment (KSCSTE), Trivandrum, with Dr. Anto Francis K., Assistant Professor in Geology as the Principal Investigator. Those interested may apply with complete bio data and M.Sc. mark list to: Dr. Anto Francis K., Principal Investigator & Assistant Professor in Geology, Government Engineering College Thrissur, Engineering College P.O., Thrissur-680009. Mob:9847266591. Last date for receiving application form: 15th December, 2018 4pm. 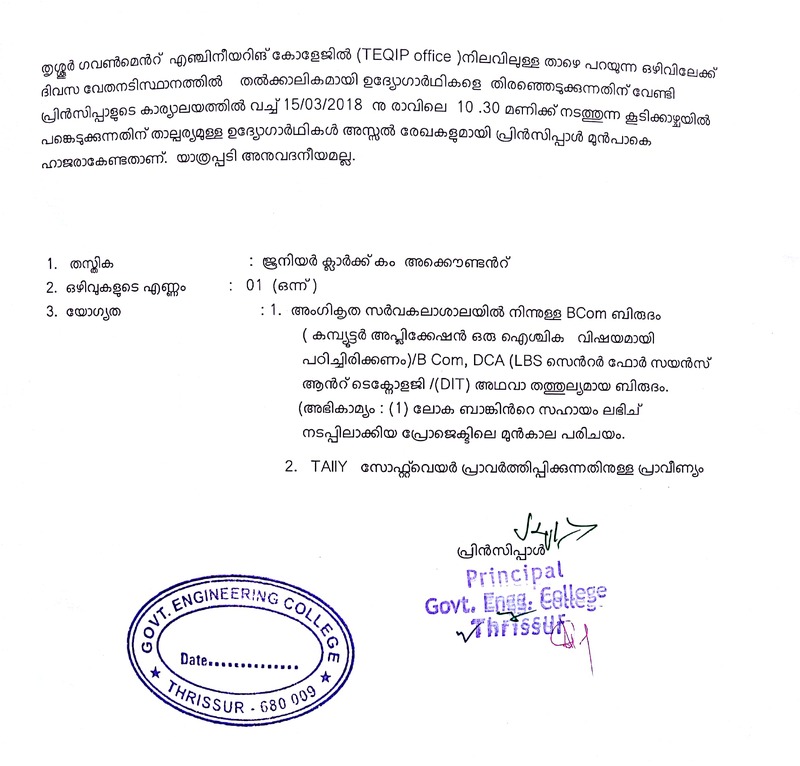 Department of Mechanical Engineering, Government Engineering College Thrissur invites young and talented persons with research aptitude to work as Project Staff for the scientific project entitled “ Development of Thermal Tomography for the Detection of Breast Cancer and to predict the size and location of the Cancerous Tissue”, sponsored by Ministry of Electronics and Information Technology, Govt. Of India. Essential : First class/60% marks in M.Tech in Mechanical Engineering/ Civil Engineering with knowledge in Finite Element Method and Computer Programming. Desirable: Knowledge in Linux and open source software, C++, MATLAB. This is an interdisciplinary project and the nature of work involves simulation and modelling of thermal profiles, development of software for thermogram generation and analysis. All the Posts are purely temporary and the appointment will be initially for a period of One year and may be extended upto the completion of the Project. On appointment, it will not confer any right on the appointee for claim for regular appointment. Selected candidate will be required to produce a medical certificate of fitness in the prescribed form, from a Government Doctor not below the rank of Civil Surgeon and character certificates from two Gazetted Officers working in Central/State Government at the time of joining the post. Selected candidate will be required to report for duty as mentioned in the offer (normally within 10 days from the date of offer) and no extension will be given. Selected candidate will be required to work till the completion of the project and resigning from the post during the currency of the project period shall not normally be entertained. Those eligible for the Post may attend an interview on 16th August, 2018, at Department of Mechanical Engineering, Government Engineering College Thrissur. The applicants shall bring originals along with copies of documents in support of Qualification, Age etc. The applicants shall also bring one recent Passport size Photograph at the time of registration. Candidates will be considered for interview only subject to verification of original documents. If more candidates turned up, a written examination of multiple choice objective type in the relevant subject will be conducted for preliminary Screening. In such cases, those who are sufficiently ranked higher will only be considered for interview. Qualification :B.Tech,M.Tech with first class. Qualification :B.Tech,M.Tech with first class or MCA with two years teaching experience. Interested candidate may report with all original documents to prove their qualification,age and experience. Interested candidate may report with all original documents to prove their qualification and experience. For a project sanctioned from Kerala State Council for Science, Technology and Environment, applications are invited for the temporary posts of project fellow and project assistant. The duration of the project is up to April 2019. The qualification and salary are as per the table given below. Appear for a walk in interview scheduled on 22.05.2018 at 10.00am in Civil Engineering Department, with bio data and relevant certificates. You have to produce following documents in original at the time of interview. Copies of all the above specified certificate/mark lists should be submitted if you have not attached theses along with your application. Revised on 17/05/2017 as per the order L1/27495/16/DTE dated 12.5.2017. BE./B.Tech and ME/M.Tech in relevant branch with First class or equivalent either in BE./B.Tech or in ME/M.Tech. Assistant Professor (Contract) in Architecture. B.Arch and M.Arch/M.Plan with first class or equivalent in either B.Arch or M.Arch/M.Plan. Assistant Professor (Contract) in Master of Computer Application. BE./B.Tech and ME/M.Tech in relevant branch (CSE or IT) with First class or equivalent either in BE./B.Tech or in ME/M.Tech. BE./B.Tech and MCA with First class or equivalent in either BE/B.Tech or MCA. MCA with First class or equivalent with two years experience in teaching AICTE/UGC recognised MCA course. * Highest qualification shall be acquired (Degree/Provisional Degree certificate) on or before the last date for submitting the application. UG and PG degrees in the concerned subject (with first class degree in UG or PG). Application shall reach the College office on or before 05.00 pm on 02/05/2017. A scanned copy of the duly filled application form shall be emailed to info@gectcr.ac.in on or before 05.00 pm on 02/05/2017. Date of written test is 21st May 2017 (Revised Date).